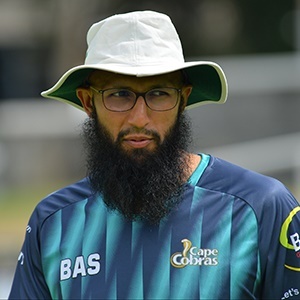 Cape Town - Cape Cobras assistant coach Faiek Davids has backed Hashim Amla to come good and hopes the CSA T20 Challenge encounter against the Warriors at Boland Park in Paarl on Friday is when the veteran batsman will find his touch again. The Proteas opener, who turned 36 last month, has been forced to take time off from competitive cricket in recent months due to family reasons. He has also not been in the best of form, especially in the recent international series against Sri Lanka. But Davids has no doubt that Amla will soon turn the corner. "Hashim has obviously been on a bad run of form, but he is a quality player," he said. "If he's available to play then we're happy to have him in the team. He is a massively experienced player and has a wealth of runs behind his name. "We know he's just one knock away from getting it right, so we back him and quite happy to have him here." The Cobras lost badly to the Titans in midweek, going down by seven wickets and conceding a bonus point in the process. "We've played two away games to start and will take one out of two against two strong sides," he added. "We need to bounce back tomorrow and we know the importance of starting well at home. "The guys are quite geared up, we had a bit of the rough end of the stick with the dew last night ... but no excuses. We're in Paarl now and need to set the record straight." Warriors coach Rivash Gobind, meanwhile, saw his side's game against the Knights in midweek abandoned on account of the weather. "It's always nice to get some momentum going, but unfortunately we couldn't get that after our game was abandoned," he said. "That was out of our control and the weather is much more promising for tomorrow. "We look forward to turning in a good performance against a Cobras side that we know is extremely dangerous."